Inspired by my best friend’s success with Baby-Led Weaning this is the method I chose when Caterpillar was six months old. 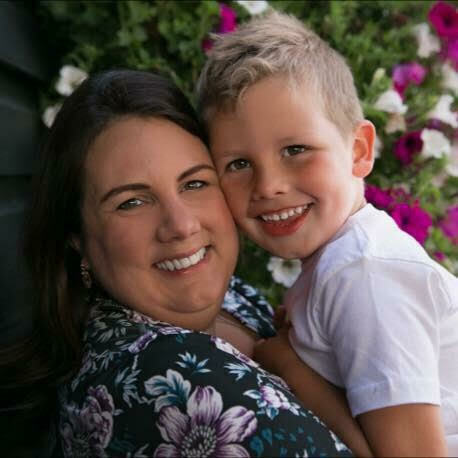 Gill Rapley and Tracey Murkett are the go-to experts on the technique and their books helped me so much at the beginning of the weaning journey. This post is the first of a two-parter, in the second I’ll share my favourite recipes from Gill and Tracey’s The Baby-led Weaning Cookbook as well as my favourite on-the-go snacks for recently weaned babies. 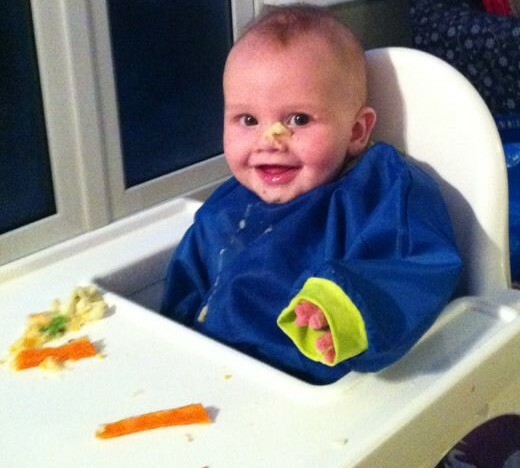 But first off, why choose baby-led weaning? I’ve never once had to use a food processor to make Caterpillar’s meals and anything that means less work is a bonus in my book. With Baby-led Weaning (BLW) there are no purées, no liquidising, no freezing and defrosting ice cube trays. I pause here because it’s probably not cheaper than making your own purées but it is definitely cheaper than buying jarred foods or specific baby meals. Once BLW was partly established, nine times out of ten Caterpillar ate the same as Hubs and I. Some people are fearful of giving their children foods with strong flavours such as mature cheese or curries and chilli con carne but we cook a lot with herbs, spices and other big flavours and never found it was a problem. Obviously I didn’t give him a curry that would blow his head off (apart from once accidentally but that’s another story!) but a wide range of milder spices went down really well. Because Caterpillar was sharing our meals it made it much more social, and also really helped when eating out as he could have some of our dinner (assuming it wasn’t processed) and we didn’t have to worry about bringing separate foods out with us and asking the staff to heat them up. I know this is controversial and there are lots of conflicting views but it’s my opinion that the purée stage of weaning just isn’t necessary. At around six months babies are naturally curious about food and want to explore different textures with their hands and mouths. 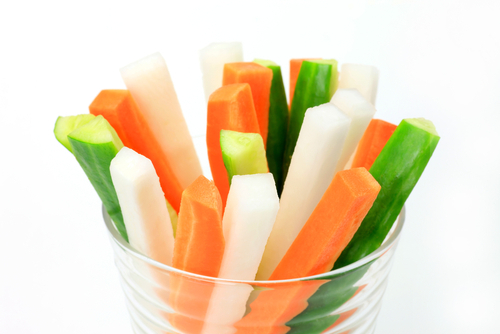 A child of this age would happily grab a carrot from your plate and start sucking on it, so why add the extra stage of taking that carrot and liquidising it? It also gives children the opportunity to taste new flavours individually rather than having several fruits, veg or meats mixed together. BLW also means you can avoid the secondary weaning stage of introducing lumps and texture, which some traditionally weaned babies struggle with. Two big fears are choking and worries about your baby getting enough nutrients. Regarding the choking, yes this is obviously something that you have to be very cautious about but some have actually suggested that BLW could help reduce the risk of choking. You can read more about this in Gill Rapley’s guidelines. It’s also important to remember the difference between choking and gagging. Gagging is just your child’s way of learning to manage the lumps of food (and babies of this age have a higher gag reflex that the rest of us, presumably for this reason). Gagging can be really scary to see the first couple of times but as long as you remember the difference between gagging and choking it’s absolutely fine, and soon passes (Caterpillar passed the gagging stage after only a couple of mealtimes). If a child is being spoon fed they aren’t given the opportunity to find that gag reflex on their own and at this key stage in their development, so when they do eventually feed themselves it could be a little more dangerous in fact. Regarding nutrition, Caterpillar was still having the same amount of milk each day when we first began BLW and we let him set the pace on the rate at which we reduced that, guided by his hunger and also how much solid food we could see in his nappy and therefore knew he had actually consumed. It didn’t take anywhere near as long as I thought it would for him to begin weaning himself off his milk, and he didn’t lose any weight in the process. Plus, don’t forget, some foods are already liquid or soft in their natural state (yoghurt, porridge, minced meat etc) and he was having these using the “loaded spoon” method, alongside finger foods, so we knew he was at least eating these, even if it was taking a little time for him to grind up his sticks of steamed veg, fruit and whole meat. The key to BLW is patience, calmness (a struggle for me I don’t mind admitting) and, by definition, letting your baby lead you. I should add a disclaimer here since my son is in that typical 2.5 yo stage now where he often fusses or refuses food. But I truly believe that this is less to do with the flavours themselves and more about him pushing boundaries and being distracted. Thankfully, he has been getting better again the last few weeks. Between six and 18 months he was certainly less fussy than some traditionally weaned babies I knew, he was eating everything. And even now he isn’t afraid of strong flavours or unusual textures which I love. I know a lot of people find weaning really stressful but we genuinely enjoyed it (and this says something as I was still recovering from PND at the time and found most things stressful!). It was easily the most exciting part of the baby stage for me and watching Caterpillar explore new flavours and textures was fascinating and often hilarious. For the second part of this Baby-led Weaning post I’ll be sharing my favourite recipes and finger food options as well as reviewing The Baby-Led Weaning Cookbook which was an enormous help to me. If you want more information on baby-led weaning, along with all the advice and safety guidelines, please visit Gill Rapley’s website. Good post! One downside is that the early sharing can give babies (and then toddlers) that everything on their parents plate is open season. I’ve watched an entire bowl of soup vanish before my eyes with a simple “I have?”. Our son was baby lead weaning via his baby sister who wanted to share her toast with him! Hey, lovely to meet you. Love your blog and link with mother butterfly and baby caterpillar. I did a mixture of purees and BLW and it worked perfectly for me. Thankfully Henry now Henry at 10 months old eats anything and can hold his own with solid foods. He loves spicy food and also tells us when he is full or wants more. However I have to admit, I hate the cleaning up when Henry goes crazy with his food. We have just started our BLW journey – 4 weeks in and it’s definitely getting easier. I can noticibly see there is less food on the floor so there must be more getting in his mouth! As an added bonus, it’s made Daddy and I eat more healthily as a lot of our dinners I was looking at thinking ‘I wouldn’t feed my baby this, why am I eating it? !’ I’m still coming to terms with the amount of mess he makes, and remembering to pack snacks and drinks when we go out, but overall I think it’s an excellent way to introduce your baby to solids! We did this with both kids, loved the freedom, the mess not so much but both love their food now! I totally agree with this, and the point that it’s so much fun for the baby. My sons love feeding themselves, but oh boy is it messy! Love this! Baby led weaning really is the way to go – my 2 year old has such a mature pallet, and I attribute a lot of that to BLW. It really gives baby an opportunity to learn to feed themselves, as well as enjoying all the texture fun that comes with it. Thanks for sharing! We are going to start baby led weaning in 2 weeks when he hits 6 months! I think he is ready now but I’m not sure I am yet! 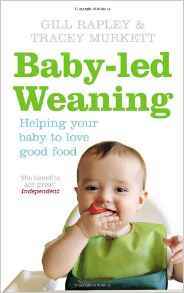 I’ve ordered the baby led weaning cookbook too. I love baby-led weaning this I did with my son but was hard for me as he was a fussy eater from day 1 but we persevered and did bit both own food and jarred feeding to keep up with his hunger needs. Thank you so much for providing individuals with a very special possiblity to read from this web site. in one week to read through the latest items you have got.